There is no doubt that communication is a skill that must be developed by everyone who wants to move into leadership roles. It’s no surprise then that my colleagues and I have been working with business leaders to improve their communication for years. In nearly every one of these engagements, the murky notion of executive presence has been brought up. Everyone who has heard the term wants to possess it, and nearly everyone can recognize it when they see it in others. But what exactly IS executive presence? Is it charisma? The ability to own a room? Being a visionary? Looking the part? While all those qualities can be important, they limit our thinking about what executive presence is. Thankfully, in her book, All the Leader You Can Be, Suzanne Bates laysout the science behind executive presence and how to achieve it. Her definition is this: executive presence is “the qualities of a leader that engage, inspire, align, and move people to act.” With that as a working definition, she breaks executive presence into three dimensions and five facets within each. Each facet is defined, and through her examples, you can begin to recognize what executive presence might mean for you. I like this book for a few different reasons. First, we finally have a science-based, working definition of what it means to possess executive presence. Second, having a clear definition helps the reader understand his or her strengths and deficiencies. Third, this definition helps my colleagues and me in our work when coaching executives. Fourth, the book is written by a woman. Ms. Bates does not fall back on stereotypes or rely on male-centric notions of what it means to be a successful business person. As I was reading it, I found myself thinking, “Yes, of course,” and “Why have I never thought of it that way?” My second time through the book (yes, I liked it that much), I began to assimilate her studies into our work as communication trainers and coaches who are often asked to weave communication training into existing leadership development programs for our clients. I highly recommend All the Leader You Can Be. It can be found online at most book retailers. What follows is my take on Suzanne Bates’ work and how we can apply it to business communicators wanting to advance their careers. Executive presence is determined on others’ perceptions of you. To alter or improve your presence, then, you must become more self-aware. This is not about losing your personality or changing who you are; it’s about modifying behaviors to (1) be intentional about how you show up, (2) improve outcomes in relationships, and (3) grow bottom-line business results. Let’s look at the three dimensions of executive presence as defined by Bates. She breaks it down into Character, Substance, and Style. It’s worth noting that until now, executive presence, at least in my mind, has been focused on style. However, presence isn’t just about how you look and act on any given day; it’s about how you show up every day, with consistency, even during periods of crisis. Within each dimension are facets that can be broken down into observable traits, which I’ve laid out in this graphic. Concern is an Essential Communication Skill? At first glance, it’s not apparent how this breakdown of traits can be useful when it comes to improving one’s communication, but once we layer in some definitions, it becomes clearer. Let’s take “concern,” which lies in the Character Dimension, as an example. With these observable behaviors in mind, you can easily see how they apply to business communication. If you’ve ever felt dismissed or unheard during a meeting, you know the negative effect a leader lacking concern can have. Again, these observable qualities apply to a leader’s ability to communicate well. People who are highly technical, for example, can sometimes have difficulty with resonance because they face challenges when trying to explain complex concepts to less technically inclined co-workers. These leadership qualities can be improved through self-awareness and one’s willingness to be a fearless listener and facilitator. Many of the facets outlined in the Bates book can be negative if too much of it is present. For example, with the facet of inclusiveness, insisting that all views are welcome can lead to inefficient meetings that go nowhere. Someone possessing too much humility (in the Character Dimension) can be viewed as being wishy-washy and unable to accept compliments. So, like with Goldilocks, there needs to be a balance. Not too little, not too much, but just the right amount of any given trait. 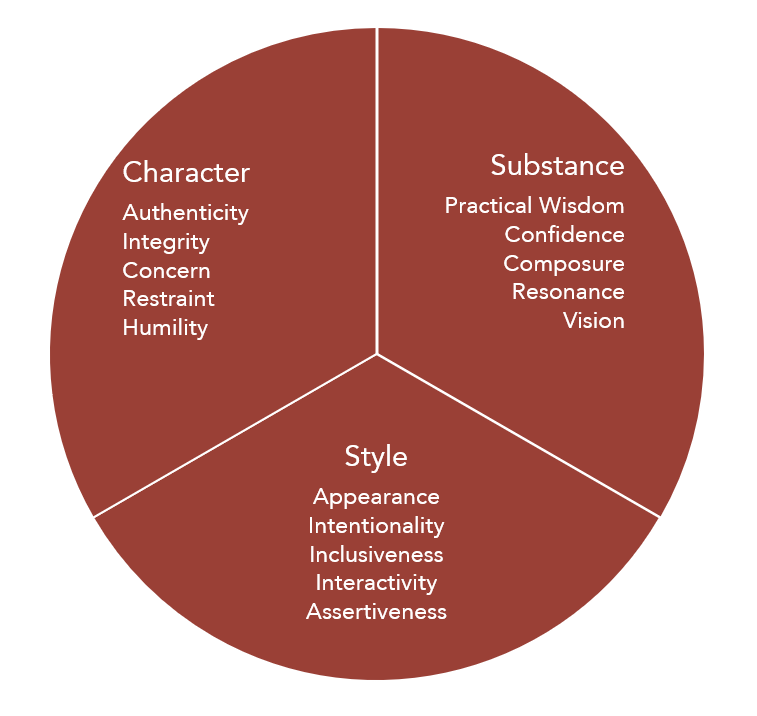 It’s the combination and degree of each of the traits someone possesses that makes each individual leader unique. While Bates doesn’t focus on emotional intelligence as an aspect of executive presence, it often comes up during the development of our leadership programs. Senior leaders often say they want their up-and-coming leaders to possess it. And like executive presence, they know it when they see it, but find it difficult to define. In their book, Emotional Intelligence 2.0, Travis Bradberry and Jean Greaves describe emotional intelligence as the ability to master four skills: Self-awareness, social awareness, self-management, and relationship management. All of these are critical to communication success, especially during high-stakes or heated business meetings. So, to connect the dots, having emotional intelligence is part of your executive presence. The two are intertwined. Personal branding is present in our work with leaders as well. Like executive presence and emotional intelligence, personal branding is more than skin deep and can be difficult to define. However, you can get at it through communication coaching. We can coach up-and-coming leaders on these attributes because they are the results of observable behaviors. Clearly, they also connect to the qualities described in All the Leader You Can Be. It’s worth noting again that everyone is unique and so is their expression of executive presence. In other words, you can be yourself and STILL possess executive presence. By now, we can agree that executive presence and branding are more than appearance. That said, appearance should not be dismissed. Like it or not, people’s perception of us is based, in large part, by our physical appearance and how we show up. I’m thankful to Suzanne Bates for making her incredibly useful research and subsequent work available in her book. She took an ambiguous concept and made it tangible. May the world benefit from leaders who are self-aware and can inspire others through effective communication. Remember to check our resource page for regular educational posts on topics like this and more.